Time and again, we have seen short-term food trends come and go. But one that remain pretty stagnant (in a good way) is the Salted Egg Yolk Craze. Then, along the way, everyone is working with their creativity and trying to incorporate this ingredient to every kind of dish possible. As big fans of the tasty salted egg yolk in both savoury dishes and sweet desserts, we are always looking out for the next best salted egg yolk dish. In our appetisers, in our desserts, in our snacks… everything. We are always ready to try. This guide includes some of our favourites from our original Salted Egg Yolk Dishes guide, and after several adventures islandwide, we have compiled a list of the best Salted Egg Yolk Dishes in Singapore. Fries all day, every day. All the better if they are coated with salted egg yolk sauce! Arbite dishes up a really mean serving for less than S$10, so this works really well as a sharing dish. Even better if you have it all to yourself. Specialising in buns (as its name suggests), Bao Makers has really unique and interesting concepts when it comes to Baos. The The Salted Egg Shrimp Bao (S$15) features juicy and plump prawns smothered in salted egg yolk sauce sandwiched between a traditional white bun. If you have yet to hear, our beloved glorious roti prata has taken on new form at Big Street Singapore and has successfully evolved into an addictive Prata Bomb stuffed with molten salted egg custard. Big Street Singapore – a two-storey casual establishment – opens till 3am from Tuesdays to Sundays and is a new favourite supper destination among Singaporeans. Thinly-cut sweet potato slices, deep-fried to a nice crisp and served with a side of salted egg sauce – Carvers & Co.’s Sweet Potato Chips With Salted Egg Yolk Sauce (S$6) is a great sharing snack among a small group before the meal! Little did we know that this coffee house also serve some really good cakes, like the Salted Egg Cake. 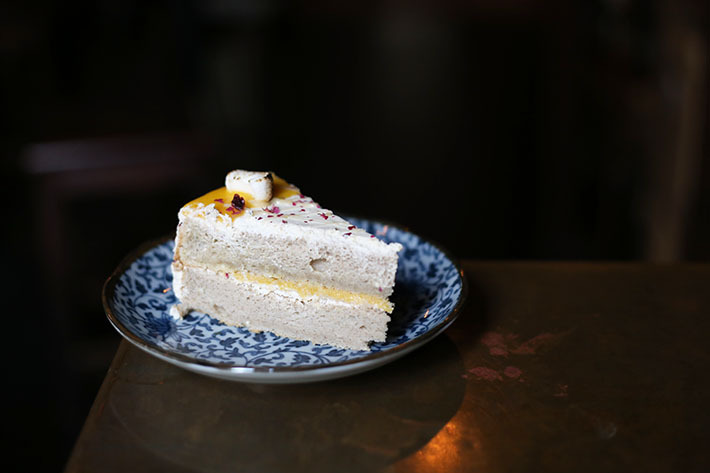 The cake has a strong tea flavour, but when paired with the salted egg sauce, it was a match made in heaven. With their in-house gelato made fresh daily with very strong local influences on their flavours, you can only imagine our delight when we saw salted egg as a flavour here. The flavour itself was distinct enough and the texture of the gelato was spot-on. Eggs Benedict is mainstream no more because the people at Drury Lane have got some tricks up their sleeves. Why, of course! Do a salted egg yolk sauce instead of the ubiquitous Hollandaise! And instead of the usual ham, you get fried bacon! We suggest you hide your weighing scale before you head down to Drury Lane. This waffle needs no introduction by now, right? 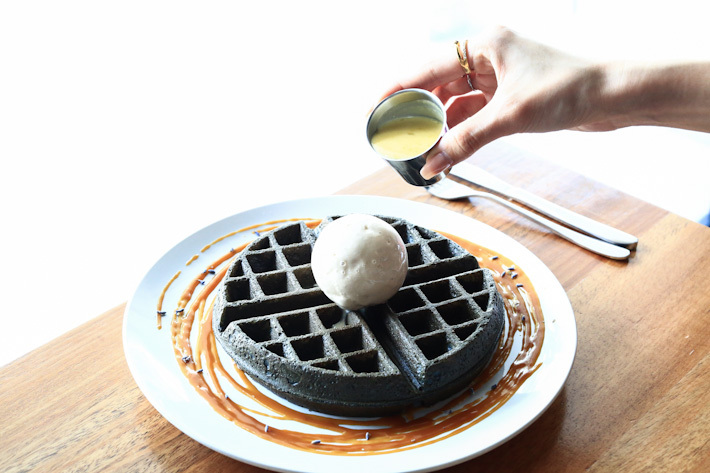 Also listed in our Guide to Most Unique Waffles in Singapore, FATCAT does it right with their Charcoal Waffles with Salted Egg Yolk Sauce (S$11.50 with a scoop of premium ice cream). A real treat to combat the heat, while seeking solace in heavenly salted egg yolk sauce. Well-known for their waffles, Froth also serves up a good eggs ben with a twist. The version here is quirky – topped off with salted egg yolk hollandaise and pork belly, it proved to be one combination that worked well for us. Now, you have to trust us on this because we’ve been there many times and they never disappoint. Totally worth the splurge! The salted egg prawns at KEK Seafood is deshelled and served with a creamy and rich salted egg sauce, littered with spicy chilli padi. We have tried many custard buns all over Singapore and Min Jiang is definitely one of the top ones on our list. Meticulously made, the Liu Sha Custard flows out like a dream to create a #foodporn moment. And we love it more because it is black. If you don’t already know, Mitzo is the sexiest Chinese restaurant in town, and one that we have dined at countless times because the food is too good. In its menu of delicate Cantonese dishes sits the unassuming Deep-fried Prawns with Salted Egg Yolk. A classic rendition of the local favourite; date nights just got tastier. Literally. The Salted Egg Ribs here are a good accompaniment to Nan Hwa Chong’s famous fish head steamboat. The salted egg is fragrant and the bite-size ribs are easy to eat generously coated with sauce. This no-frills eatery on level 5 of Far East Plaza is always packed during lunch and dinner for a good reason – it serves well-cooked zi char style dishes at very affordable prices from S$4.80 onwards. The must-try dish here is definitely the Salted Egg Pork Ribs Rice (S$6). It truly lives up to its name and we dare say it is one of the most satisfying cheap eats in Orchard Road. No Signboard is a stalwart in Singapore. 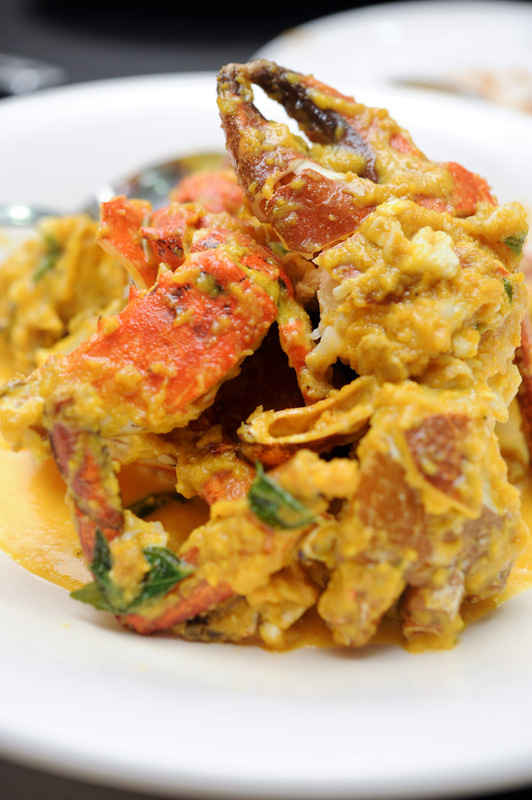 Famed for their seafood, No Signboard is the place to bring your overseas guests to for a truly local-style indulgent, and please do not do that without ordering the Salted Egg Yolk Crab. Even with an address, locating the bar is a task in itself. This under-the-radar speakeasy has no signs, so keep your eyes peeled for their logo scrawled on the wall. And when you finally find them, treat yourself to a Salted Egg Yolk Cocktail (S$25)! PARK at Holland Village is jumping on the bandwagon with the obsession of salted egg - but we are totally digging their rendition of Salted Egg Ribs (S$29.50++)! 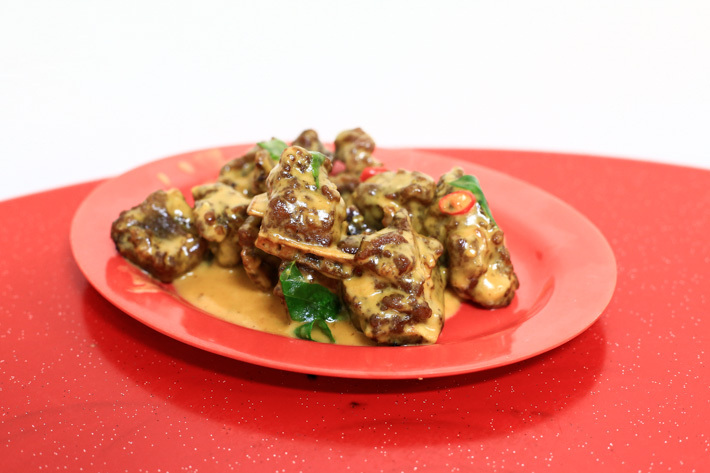 Think zi chart-style succulent pork ribs marinated in handcrafted addictive salted egg yolk sauce, but in generous portions of huge ribs and a cosy environment with beer. You bet we were sold! We already know how great fried chicken tastes like, but when coated with salted egg yolk sauce, it is pure genius! The Salted Egg Yolk Cookies are Sinpopo’s newest creation and they combine the best in a butter cookie with the much loved fragrance of salted egg yolk and curry leaves. 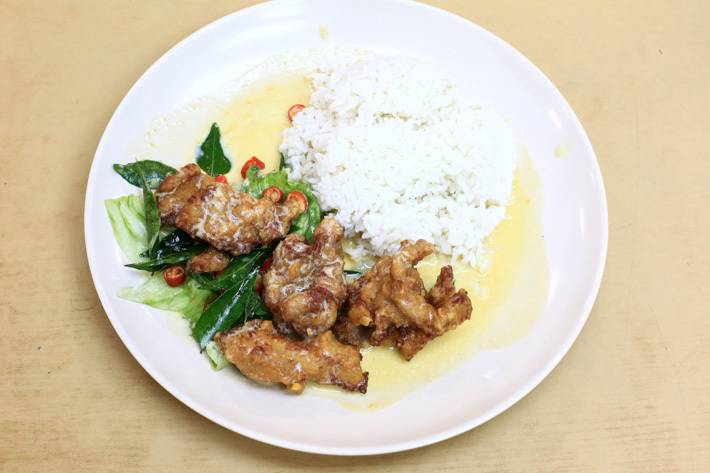 Taste Good at Sim Lim Square does a salted egg yolk chicken that has us falling in love with every bite. The richness and creaminess of the salted egg yolk that combines with the crispiness of the chicken is totally to die for. It can do with more sauce, though. This cute little patisserie that specialises in tarts deserves a huge shout-out. Sitting inside Millenia Walk, Tart Blanc is a real gem. The tarts are baked fresh daily, and there are different surprises every day. Of course, if you see the Salted Egg Yolk Tart (S7.50), you know that is the one to go for. We chanced upon this food booth by Soup Restaurant at Takashimaya’s food hall and saw that they had a fried tofu with salted egg yolk sauce (S$4.50) cup to go and we knew we had to try it. Albeit nothing special, the sauce itself was decent and it made a good snack for our shopping adventures in Orchard Road. The Refinery’s Salted Egg Yolk Onion Rings had us at hello. Thick cuts of onions coated with beer batter, deep fried, then lavishly coated with salted egg yolk sauce… no, you better taste it for yourself and enlighten us – what adjective is better than ‘best’? This unassuming eatery is ever crowded. Well-loved for their fish head steamboat, a meal here is local-like and fuss-free, but most comforting. And we need you to know this – they serve the best Salted Egg Yolk Pork Ribs (S$10) in Singapore. Absolutely nothing beats this! Tom’s Palette has been offering its Salted Egg Yolk ice cream for years, way before the start of the salted egg yolk craze in Singapore. 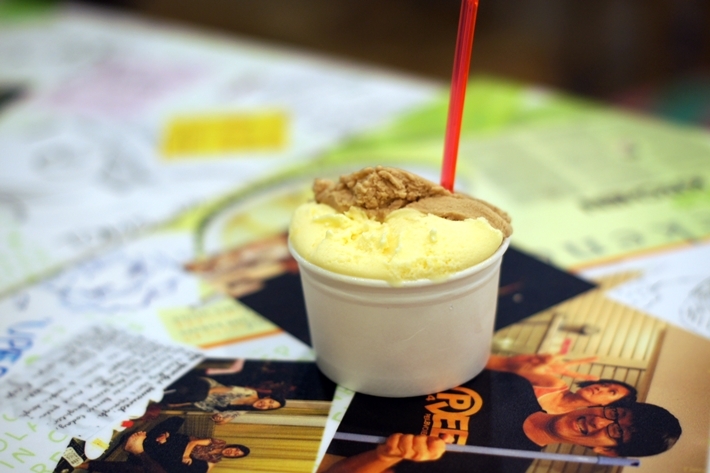 All ice cream here are made in-house with less cream, sugar and less air beaten in for a richer taste. Having the Salted Egg Yolk Ice Cream (S$3.20) is like eating spoonfuls of smooth salted egg yolk custard, with textures similar to that of Italian gelato. We always love a good dim sum meal at TungLok Signatures, but apart from the regular suspects, we need to have a serving of this Crispy Fish Skin with Salted Egg Yolk (S$10) on our table. Better than potato chips, this has us munching non-stop! Besides Fatcat Ice Cream Bar, another place that you should try is Twenty Grammes. The Charcoal Waffle (S$8.50) at Twenty Grammes was definitely on point. The crisp outer layer, coupled with the addition of an ultra-rich and slightly thicker salted egg yolk sauce, is such a divine combination. The sauce is served in a huge and generous pot and we could not have been more delighted and satisfied. 7Kickstart Cafe at the Singapore Art Museum has been gaining popularity for its Liu Sha French Toast (S$13). The generous portion of salted egg yolk sauce was divine; creamy and savoury, with that slight hint of sweetness.